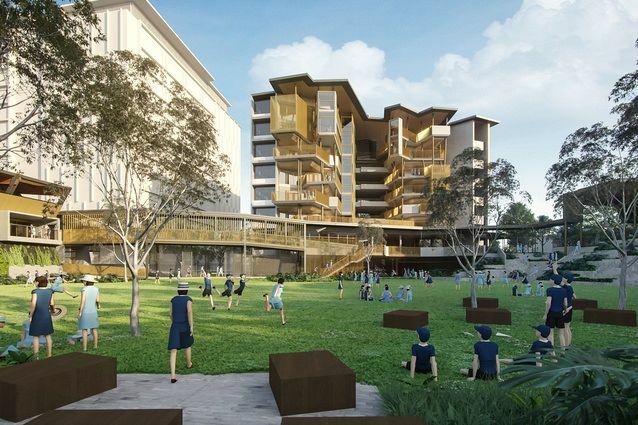 Construction has begun on Brisbane’s first vertical school – the first school to be built-in inner-city Brisbane in 50 years. To be located on a tight site between St Pauls Terrace and Brookes Street in Fortitude Valley, the years 7-12 secondary college will service growing communities in and around Fortitude Valley, Newstead, Bowen Hills and New Farm. It is being delivered by the Queensland Department of Education in conjunction with the Queensland University of Technology and will seek to relieve enrolment pressure on Kelvin Grove State College. The Department of Education ran a competition for the design of the school, which was won by Cox Architecture. Cox’s concept plan envisioned a number of distinct buildings organized around a central green space. The “vertical” component of the school will rise to seven-storeys and include a roof terrace, with each floor containing a mix of traditional classrooms and flexible learning environments. The existing school building on the site will be retained within a new performing arts precinct. “The campus has been designed to respond to local context and the subtropical climate which results in a distinctive and compelling identity based in place-making and that encourages an inclusive and community-centred culture,” said Cox director Christina Cho. “Each level is programmed with a mix of general and specialist learning spaces around a naturally ventilated atrium providing students and staff with a high level of connectivity to nature and the external environment. Thomson Adsett has been engaged to lead documentation for the project in collaboration with Hutchinson Builders, while Cox Architecture has been retained as technical advisor. Premier Annastacia Palaszczuk and education minister Grace marked the beginning of construction on 13 November with a sod-turning ceremony, where they also released the proposed catchment area. “Brisbane-founded Hutchinson Builders has been awarded the contract to build this leading state high school and I am also delighted that Brisbane architect Thomson Adsett will lead the detailed design in partnership with Hutchinson Builders,” said Palaszczuk. According to the latest data from the Queensland Government Statistician’s Office, the number of children living in the inner-city has increased by 30 percent since 2011 and a further 3,000 school students are expected to move to the area over the next five years. The Inner-City North State Secondary College will accommodate 1,500 students and is expected to open in 2020. The government has also begun planning for a new secondary college at Dutton Park in the inner south, which will be delivered in partnership with the University of Queensland and is slated to open in 2021.